The Oasis live experience of recent years has always seemed to be steeped in mediocrity, in no better way illustrated than by their last few swings through New York City. October ’97 – hot on the heels of the hype of Be Here Now, their two nights at the Hammerstein Ballroom had all the makings of an exclusive, unforgettable event. Unfortunately, vocalist Liam Gallagher sounded like he’d been gargling Dran-O and snorting Comet, lethally marring an already bloated performance. The following January, the band went through the motions of an abbreviated, uninspired set to a half-full Meadowlands Arena in picturesque suburban New Jersey. And finally, in May, 2000, the latest Oasis line-up (sans founding members Bonehead & Guigsy) made a somewhat tentative and low-key New York debut at Radio City Music Hall. An improvement for sure, but not enough to erase the black marks of their previous visits. So it was no surprise that the announcement of Tour of Brotherly Love (Oasis with Spacehog and the Black Crowes, all fronted by pairs of brothers, naturally) was met with a certain element of disdain. After two relatively mediocre albums, Oasis’ stock (at least in the U.S.) was at an all-time low. The main attraction had shifted from Noel Gallagher’s irrepressible songwriting stills to voyeuristic speculation of whether or not the notoriously combustible Brothers Gallagher would, in fact, kill each other on stage. Which is why it was so astounding to see what occurred in their second stint at the hallowed Radio City that weekend. Coming onstage to an absurd bluegrass instrumental cover of “Strawberry Fields Forever”, the band immediately kicked into “Go Let It Out”, from last year’s Standing On The Shoulder Of Giants, and proceeded to dismiss any and all notions that they had lost touch with the formula that, in the mid-‘90s, made them the biggest band in Britain since the Beatles. Traditional live stalwarts “Roll With It”, “Live Forever”, “Supersonic”, and “Stand By Me” were dropped in favor of album tracks and obscurities, with such classics as “Morning Glory”, “Slide Away”, and the long-forgotten b-side “Fade Away” spicing up the usual “greatest hits” set as seen on last year’s Familiar To Millions live album. Revamped set-list or not, though, Oasis still had to deliver the goods. And deliver they did. New members Gem Archer (guitar) and Andy Bell (bass) are now fully enmeshed with the band’s sound and give Oasis a musical flexibility that was impossible to imagine back in the days of the original line-up. Drummer Steve White (filling in – and keeping the “Brotherly Love” theme intact - for younger brother Alan, out with a thumb injury) pounded his kit with flair and authority, giving Oasis a (literal) kick they’d been sorely lacking. And with the rhythm section sufficiently lubricated, guitarist Noel had the confidence to lead the band into a series of extended guitar solos and drawn-out finales. This new flexibility was most apparent with the metallic groove of “Acquiesce”, the throbbing coda of “Gas Panic!” and throughout the absolutely skull-imploding medley of “Tomorrow Never Knows/Cigarettes & Alcohol/Whole Lotta Love”. 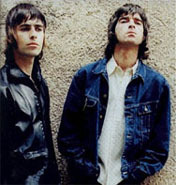 But the show’s true surprise, and the key to the Oasis live experience, was the performance of lead singer Liam. His voice has not only improved since last year; it’s better than even on the albums themselves. Simply put, he has never sounded this good in his life. Ever. His trademark raspy bellow was spot-on and crystal-clear, without losing any of its sneer or bite (though true to form, his between-song ramblings remained largely incoherent). And with his trademark hands-behind-the-back microphone stance, towel draped around his shoulders, and venomous arrogance seeping out of every syllable, Liam reaffirmed his status as the most magnetic stage presence since Johnny Rotten and quite possibly first true rock star to come along in a generation. Not to mention the best tambourine player since Davy Jones. And so it was this combination of energy, skill, and attitude that propelled the revitalized Oasis to an entirely new musical level. The stunning finale of “Champagne Supernova”, “Don’t Look Back In Anger”, and “I Am The Walrus” left the Oasis fans at Radio City slack-jawed and had even the straight-outta-Altamont Black Crowes following on their feet. After years of bold proclamations that never quite fully rang true, it’s nice to see Oasis finally live up to their claim of being the best band in the world today.